Last weekend, I visited two unusually fancy libraries. 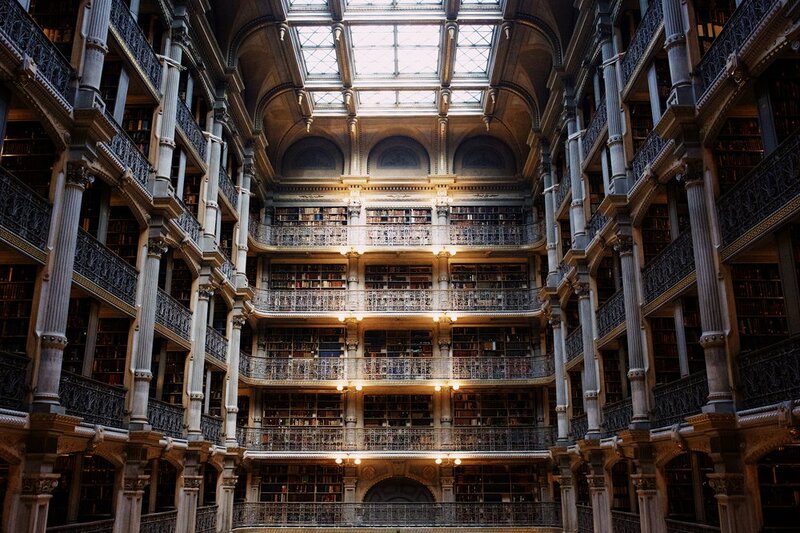 The first was the Peabody Library in Baltimore. The second was the Library of Congress, here in D.C. The Peabody is absolutely beautiful and one day I will convince someone to let me bring a large camera rig in and do some proper photos. Until then, there's this, which I still like. As for the Library of Congress, it was an open house day, where the public could visit every wing of the building, including the reading room, for which you otherwise need permission. The grayscale mural is from that room. Camera: Fuji X100T with wide-angle conversion lens. Processed using VSCO for iOS.